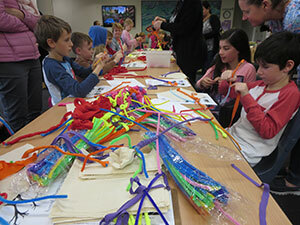 Riverina Science Festival goers can craft a healthy brain with Neural Knitworks at Wagga Wagga Art Galleries. 2016 marks the third year in a row that the Riverina Science Hub will celebrate National Science Week with a jam packed festival in Wagga Wagga! This year’s program kicks off on Saturday 13 August with a scientific Water Bug Investigation. Throughout the week there will be a whole range of hands on activities, performances, talks and film screenings appealing to audiences of all ages. Held at the recently reclaimed Marrabbidya Wetland, the Water Bug Investigation will be facilitated by Environmental Education Officer Alice Kent. Participants will have the opportunity to dive into the underwater world of Wagga Wagga’s newest aquatic habitat at this unique, all ages event. Two of last year’s most popular events, Microvision, Microscope Morning, My Place in Space with the Wagga Wagga Observatory and Kitchen Science Storytime, will return to the Wagga Wagga City Library. Festival goers can also look forward to crafting a healthy brain with Neural Knitworks, a wonderful neuroscience awareness project at which you get to make your own hand crafted neurons from yarn following scientifically informed patterns, which will be run for the duration of National Science Week in the Wagga Wagga Art Galleries E3 Space. You can learn about the science of sound at the Museum of the Riverina, where sound artist Dave Burraston from the Wired Lab will be hosting an interactive talk about how science and art intersected to pioneer the sounds that revolutionised pop culture. Don’t miss Dave’s presentation: Sound Synthesizers in Music and Pop Culture. The Museum will also be running two science of sound workshops, Build an Instrument and Bull Roar! And taking science to the streets, Thursday late night shoppers will be in for a treat when Scientwists presents two family friendly science shows in the Wagga Market Place, one of Wagga’s busiest shopping centres. This event will also showcase Super Market Botany with local scientist John Harper from Charles Sturt University. Vegetation Management Officer Matt McGrath will be on hand as well, demonstrating how to use Weedwise, a new app that helps community members combat weeds on their own patch of turf. For the film buffs, the free SCINEMA International Science Film Festival, will be screened every week day between 12pm and 2pm at the Wagga Wagga City Library, where participants will be welcomed to eat and geek in their own lunch time! Finally, local engineer Alexander Fenwick will lead Against the Flow, a tour of our city’s levee banks. All in all it’s all shaping up to be terrific National Science Week here in here in the Riverina which is an Inspiring Australia initiative is supported by the Australian Government. You can find details of all these events and more on the National Science Week website at www.scienceweek.net.au. Christine Bolton is the Team Leader Programs Promotions & Partnerships at Wagga Wagga City Library and the convenor of the Riverina Science Hub.